Q: My 3-year-old boy loves the movie Wreck-It Ralph produced by Walt Disney. But one big concern would be whether such commercial DVD (maybe kinda out of copy right protection) can be copied and backed up to prevent from the kid's careless wreck? Analysis: For general home-made DVDs, Handbrake, a famous open-sourced video transcode program, is a free solution mainly to convert DVD to MPEG4 format compatible with most Apple and some Android devices. The output formats and profiles are somewhat too limited to meet different users' needs. In addition, Handbrake is more suitable for advanced users for it requires lots of manual settings. But neither of them is the main concern of it as a totally free home-use tool. Honestly however, the biggest obstacle of Handbrake is the lack of ability to cope with commercial and more specifically, copy-protected DVDs. So it is not at all surprising if you fail to Handbrake rip DVD like Wreck-It Ralph, which is strongly encrypted by Disney, the releaser and distributer. Wreck-It Ralph, the animated family-action comedy, is the 52nd animated feature in the Walt Disney Animated Classics series. However, Disney owns by far the strongest DVD encryption trick called X-project DRM. It is almost the most sophisticated copy protection at present. To copy and back up DVD Wreck-It Ralph, you need find an almighty Handbrake alternative capable of removing such codes. 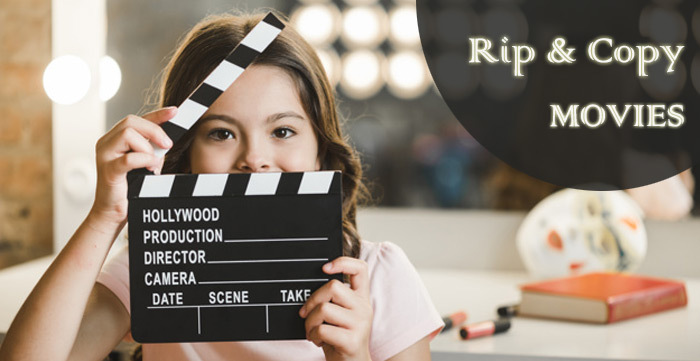 WinX DVD Ripper Platinum should be your first and last try to back up all your existing DVDs, including that of the Best Hollywood Action Movies, with ability to bypass all DVD region codes and copy protections. Besides, it can rip DVD to video file on PC with excellent quality at fast speed, even preserving the original 5.1 Channel AC3/DTS Dolby Audio effect. Insert Disney DVD Wreck-It Ralph into computer, launch the DVD ripper and load movie by clicking DVD Disc button. Or if you don't have a DVD at hand, you can load ISO image or DVD folder already in computer hard drive. Select an output video format you like or need among 300+ profile provided by the software. You can rip and convert Wreck-It Ralph DVD to AVI, MPEG, WMV, MOV, MP4, etc, and play back Wreck-It Ralph movie on Samsung, Galaxy Tab, Galaxy Note, HTC, iPhone 4S/5, iPad mini, Kindle Fire, Surface, WP8, and any other popular portable device by choosing the corresponding profile before ripping. 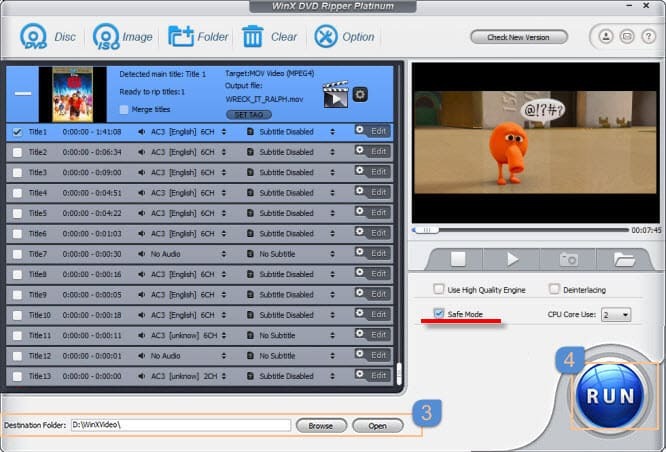 After selecting the output format profile, WinX DVD Ripper Platinum/WinX DVD Ripper for Mac will auto check the main title of DVD Wreck-It Ralph (Title 1) for you. If it is not the title number you want, you can recheck it by yourself. It is strongly suggested to check Safe Mode for more smooth DVD conversion of Wreck-It Ralph. It is operable if you want to change the default disk and folder to store the output video. After examining and confirming the previous options you have completed, you can just click Run button to start ripping DVD Wreck-It Ralph. Clone DVD Wreck-It Ralph to DVD: If you have the DVD or the ISO image file of Wreck-It Ralph, you can use WinX DVD Copy Pro to copy DVD to DVD or burn ISO to DVD. Convert DVD Wreck-It Ralph to Music: You can extract the music out of the movie and converting DVD to MP3/AAC/AC3 audio file.